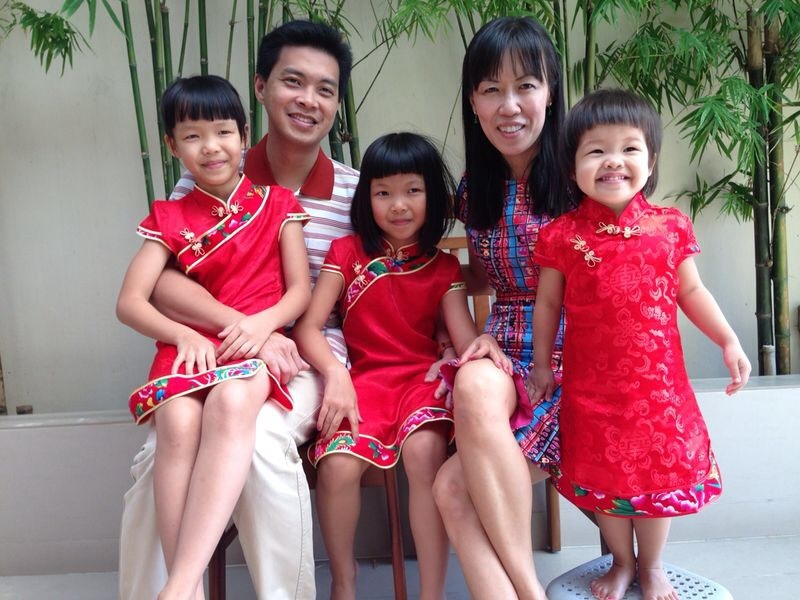 Daniel, his wife Hsueh-lien and their 3 daughters. Photo courtesy of Daniel Kan.
Daniel Kan, 38, is a teacher-musician. Happily married for ten years to Hsueh-lien, 42, a music therapist, the couple has 3 daughters, Darlene, Jewel and Olive-ia, aged 8, 7 and 2 respectively. The music gene runs in the family. His parents met in the choir, his brother “sings like Andy Lau”, his sister plays the piano expertly, whilst his uncle was the drummer in a popular band in the 1950s. Extremely versatile himself, Daniel plays the drums, electric and acoustic guitars, keyboard, clarinet and violin. Hsueh-lien plays the piano, Darlene sings and plays the keyboard, Jewel is learning the violin and Olive-ia has the budding flair of a drummer! Besides looking upon music as a form of celebration, Daniel also uses it to teach numbers, counting, and as a tool to fine-tune his kids’ Character, instill Confidence, hone Competence and spark Chemistry – his top Cs. At home, this Dad turns into a life coach: He sets the “syllabus” by breaking down complex concepts into digestible morsels for kids. He also trains them to listen, follow instructions and perform tasks, though simple, exceedingly well. He urges beginners to start by borrowing “white elephant” instruments, lying around, unused or spare, from friends and neighbours. By focusing on creating platforms for music learners to perform simple repertoires before loved ones, friends or colleagues, he demonstrates that it is possible for a family, a group of friends or colleagues to grasp and play to a common beat and that the seemingly high “mountain of music-making” can be more easily overcome than most think. Daniel believes that music can help people who find themselves socially excluded, “trapped in their caves”, with hidden talents or untapped potential. Through his wife’s music therapy work and interaction with special needs children, Daniel recently got acquainted with a mildly autistic child and his family. Once he found the boy’s “frequency” and what excited him, he realized that the child could then sit for longer periods of time and concentrate. Daniel helped form the family into a band, which they all thoroughly enjoyed. When Daniel sings and plays his favourite songs, his daughters keenly look over his shoulders, to learn from, imitate and model him. He hopes to reach out to at-risk youth in a new project, to instill – through music – a culture of honouring, loving and serving others and working as a team beyond self-interests. To Daniel, there exists but a thin line between music and magic – both are invisible, yet unravel beautifully and stunningly when performed before an audience. As a family learns to sing and move in agreement to its internal rhythm, it gathers familial momentum and stirs powerfully as one. Soon enough, the musical beat transforms itself seamlessly into a “Family Heartbeat” resonating deeply and acutely felt by one and all.